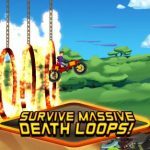 Miniclip’s Bike Rivals is a motocross game for mobile devices that relies a lot on in-game physics. 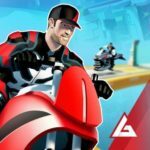 Just as it is in real-life races, your objective is to get the fastest time, but then again, you’ll also have to beat the clock and finish a level at a certain time. The controls of the game are simple enough, allowing for tap gestures to accelerate or hit on the brakes, and for tilting your phone or tablet to lean backwards or forward. You can also get power-ups by doing tricks on your bike, or by completing certain levels. 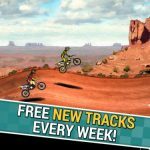 Now, we’ve got five great Bike Rivals cheats for anyone who wants to finish first place and get three-star levels on a consistent basis. In the real world, doing stunts in a motocross race isn’t exactly the best way to win a race. 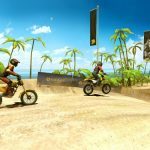 But in here, doing stunts is exactly what you have to do if you want to get more power-ups, and subsequently better times and more three-star levels. When executing a stunt, tilt your device ever so gently to the right or left – overdo it and that’s going to send you crashing down. Once again, that’s where in-game mechanics and real life diverge, as doing stunts, as we said, can get you some boosts. Doing a flip will earn you some nitro, which can give you a nice boost of speed; still, you don’t want to overdo this, as going too fast will make you lose control of your bike. Wheelies are another stunt you can do to get yourself some nitro. It sounds simple to execute – tilt your device a bit to raise the back tire of your bike once you’re on a flat surface. But in practice, you’ll find it very difficult at first, and may end up crashing more often than doing the stunt right. Once you’ve got this stunt mastered, though, that will give you even more nitro in a safer environment as compared to flips. 4. How To Start Levels With A Big Burst Of Speed? Hold down both brakes and gas while your bike is at a standing start. Let go of the brakes once you’re given the go signal, and you’ll be off to a flying start, thanks to this “burnout” technique. Your head is the most sensitive part of your body in Bike Rivals, and once it comes in contact with obstacles or terrain, that’ll knock your rider out and force you to restart from scratch. This makes it even more important to drive carefully when you don’t know what’s ahead of you. Watch out for inclines, as going too fast will have your rider’s head hitting the ceiling, thus ending your level. Going too slow, on the other hand, may result in an unexpected spill following a bump, or even a tilt of your bike.